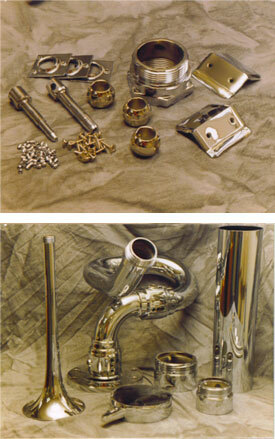 McDowell Enterprises specializes in various electroplating methods to produce high quality metal finishes for chromium, hard chromium, copper, gold, nickel, and zinc. Chromium – A silver-white deposit used to minimize galvanic corrosion on parts or assemblies consisting of dissimilar metals such as brass and steel, and to provide corrosion protection in certain harsh environments. Hard Chromium – A blue-gray deposit used to provide wear resistance on such parts as pistons, cylinders, aircraft engine parts, cutting tools, dies, oil tool parts, and valves. Copper – A reddish deposit used for plating through holes on circuit boards in the electronic industry, on steel wire for making high-strength electric cable, and as a stop-off to prevent case hardening on selected areas of iron and steel surfaces. Nickel – A silver-white deposit used generally on industrial products for corrosion protection, and to prevent iron contamination in the chemical, food processing, and medical industries. Zinc – A silver deposit which can be colored yellow or black used to protect metals such as iron and steel against the relentless forces of corrosion.